This well equipped five bedroom villa on the Sunset Ridge community is in an ideal location for your family holiday. A wide range of amenities such as bars, restaurants, golf courses and shops are a short car drive away. Queen-size bed, walk-in closet, ceiling fan, TV. En-suite bathroom contains shower over bath, sink, door to pool, WC. Queen-size bed, walk-in closet, ceiling fan, TV. En-suite bathroom contains shower over bath, sink, WC. Family bathroom contains shower over bath, two single sinks, WC. Sitting on the Sunset Ridge community in Davenport, this five bedroom villa is ideal for your family holiday. With themed bedrooms for the children and plenty of space for the whole family this villa has everything you need to enjoy your stay in Orlando. 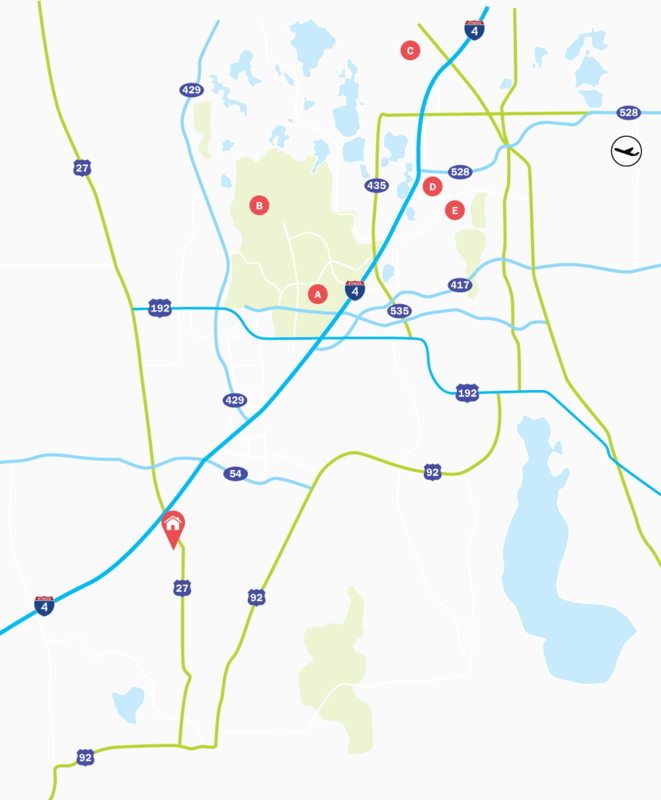 Just off the US27 and close to the I-4 theme parks, Orlando attractions and amenities are all within a short car drive away, making it the perfect location for your stay. If you have interest in booking this villa, please contact us for an update. If you are booking more than 12 months in advance please do double check with us the availability on this home. The calendar often updates just 12 months ahead. Living Accommodation - As you enter the villa you immediately see the dining table seating six to the left. To the right of the front door is a small formal seating area with a TV. In the middle of the villa is the well equipped kitchen overlooking the family lounge area which has a leather sofa, two single leather chairs and a flatscreen TV. Bedrooms - The Master bedroom is at the back of the house to the right of the main lounge area and has a Queen-size bed and an en-suite which has a patio door out to the pool deck. Opposite the Master bedroom on the left-hand side of the family lounge area is bedroom 2 which contains a Queen-size bed and an en-suite bathroom. Bedroom 3 is to the right of the kitchen in the middle of the villa and has twin beds. Bedroom 4 is a princess themed bedroom with twin beds. Next to bedroom 4 is bedroom 5 and is a Frozen themed bedroom with twin beds. Outdoor Living - The inviting pool deck with a good amount of privacy has a covered seating area and dining under an umbrella with seating for four people. This pool deck is south easterly facing. Sunset ridge is a quiet and peaceful community, which sits just off the US27, 1 mile south of the I-4 highway. Built between 2002 and 2005, Sunset Ridge is a well-established community home to both residential villas and vacation homes. As the community is situated close to the I-4 Disney theme parks can be reached within a 15-minute car journey. Posner Park, an outdoor shopping development with some of America’s biggest brands and a 10-screen cinema is less than a mile from the community.